Understanding and using academic language is at the heart of ELs’ language development and mastery of grade-level content. But when tackling a new text or grade-level content topic with your students, it can be challenging to figure out what vocabulary to focus on and how to help ELs make meaning of complex sentences and distinct discourse structures. This course, designed for both ESOL and content teachers, will help! We’ll explore research-based practices for supporting ELs as they acquire both language and content knowledge. This course is based on Diane Staehr Fenner and Sydney Snyder’s best selling book Unlocking English Learners’ Potential: Strategies for Making Content Accessible. Course facilitators from the SupportEd team will collaborate with you in an online, interactive self-paced course on building ELs’ academic language at the word, sentence, and discourse level. As in our other online courses, the heart of this course is a facilitated Professional Learning Community (PLC)-based discussion. 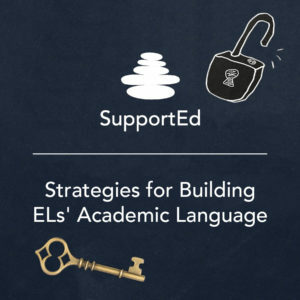 You will be able to share your expertise with colleagues as well as learn what strategies others are using to build ELs’ academic language in their schools and districts.